The smallest mower Brill makes it the Razorcut 33 reel mower. The cutting blade is 33 cm wide which is 13″. This reel mower is best for lawns of 2000 sq’ or less. It can be easily stored and hung on a hook. A grass catcher is an option. Great mower for condos and small lawns…it is incredibly light at 15 pounds…everyone can push this (including my grandmother)! 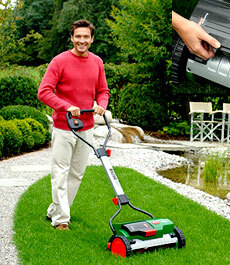 The next model is Europe’s #1 selling reel mower, made in Germany, the Brill Razorcut 38. The cutting blade is 38 cm / 15″ wide. This reel mower will handle jobs of 10,000 sq’ or less. The Razorcut 38 can certainly do more but we have found the person mowing often tires when mowing more than 10,000 sq’. A grass catcher is an option for the 38. Mow your lawn when you are ready…9 am or 9 pm. The Brill Razor is so silent your neighbors can enjoy their activities in peace and you can even talk on your cell phone! Your children can play safely along side a reel mower: there are no flying objects or toxic fumes. Mowing your lawn with reel mowers is better for the air, better for the grass, and better for you. Want to know specific differences between push mower models and manufacturers …check out our Push Mower Comparison Chart and our Brill/Sunlawn Comparison Chart. Already sold on a reel mower, you probably want to read our guide to transitioning your lawn. And remember, we have a 30 day trial period. Lastly, Brill offers the unique electric reel mower: Accu Razorcut. The Razorcut is a battery powered version of the Razorcut 38. The Accu battery is inserted into the mower and taken out to charge. This means more than one battery can be purchased for larger jobs. One battery will power the mower for about 35 minutes. The Brill Accu Razorcut is the quietest electric mower made today. One highlight of the Accu Razorcut is that it can be used as a manual mower as well. So if you have a little bit more to do to complete the lawn, you can just use it like a Razorcut 38. As with the other two Brill reel mowers, a grass catcher is an option for the Accu Razorcut electric reel mower. This entry was posted in GARDEN, LAWN MOWERS and tagged Brill Razorcut, eco mowers, electric mower, electric power, energy efficiency, ENVIRONMENT, environmental, gardening, gas mower pollution, gas mowers, green, lawn mower, LAWN MOWERS, lawn mowing, lawnmowers, new electric mowers, push mowers, reel blades, reel lawn mowers, reel lawnmower, reel mower, spring 2009 models, sustainability, sustainablity. Bookmark the permalink.